This entry was posted on Wednesday, May 9th, 2012 at 1:42 am and is filed under Uncategorized. You can follow any responses to this entry through the RSS 2.0 feed. You can leave a response, or trackback from your own site. 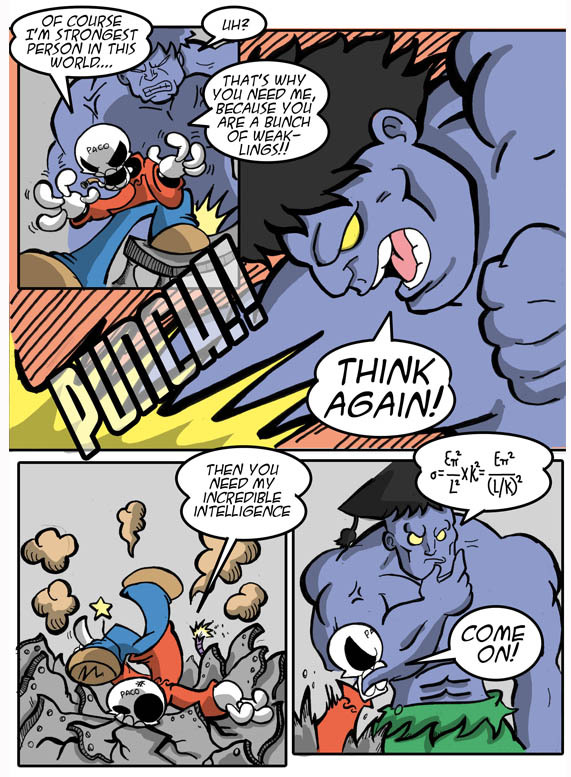 LOL Great for Hulk (Being Blue, I’m calling him Sulk) to show Paco up. He looks a kinda like the Grey Hulk. But Bulk here has a better taste in fashion. Ah, yes, the Professor Bulk phase… first seen in The Incredulous Bulk #377. Too bad it’s only a temporary fix. I love how so many superheroes are super genius scientists.. it makes me feel better about being a smarty mcsmarts..
the Bulk is a bit bluer than the Infraggable Krunk..
a purple monster whit green pants. I see what you did there 😉 smart hulk. PS: suddenly I am in the mood to read Planet Paco. Cuando las historietas impresas? mis alumnos preguntan!